Sirens warn of rockets from Gaza, as Arab media reports IDF bulldozers are operating near security fence. IDF: No strikes detected yet. Color red rocket warning sirens were sounded on Thursday afternoon in the Gaza Belt region just adjacent to the Hamas-enclave of Gaza, even as IDF bulldozers reportedly were working just inside the security fence. Reports have yet to come in regarding how many rockets were fired or where they may have fallen. Security sources were dispatched to check if any rockets made landfall and if they may have caused any damage. 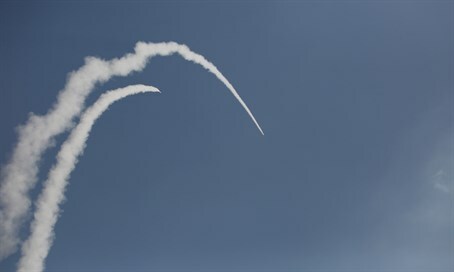 The IDF later said in a statement that the warning sirens had been activated in the Sha'ar Hanegev Regional Council area, but no rocket strikes have yet been detected in Israeli territory. It added that the matter is being checked. IDF sources reportedly have said the siren was likely triggered by gunfire in Gaza rather than rocket fire. Just a short time earlier on Thursday afternoon, the Palestinian Arab Ma'an News Agency reported that IDF bulldozers were active on the Gaza border. According to some Arab reports there were five IDF bulldozers working several dozen meters inside the security fence.